First off, there are no bad Elton Dean solos, pieces, projects, CD's et al. The guy was impeccable. According to Hugh Hopper, he was a "natural," and there's plenty of evidence to support this. From "Slightly All the Time" off Soft Machine Third (1970), which is an amazing "long-form" piece incorporating a number of Mike Ratledege compositions, each segueing into a seamless side long journey. (1) After the main theme, there are three short Elton solos over a static chord, each about 1 1/2 minutes long, each telling a story, each "upping the ante," meaning gaining in intensity. By the third one, he's sailing way up into the altissimo register, though keeping the melodic content intact. It's a brilliant example of his wholly unique "jazz" solo style. (2) Around the mark, as the piece morphs into "Backwards," with its reverbed, synth wash, Elton launches into an epic solo that can best be described as "elegiac." It's a subdued, lyrical melodic solo played almost wholly in the middle register . This particular solo shows off a tender haunted-ness, though surprisingly comforting. I imagine a shepard playing to his flock high-up on a desolate English countryside. It's flat out beautiful. So, that's Elton taking wing on Mike Ratledge's thematic material. Now, to free-from Elton Dean. It's well-known that Elton wanted to take Soft Machine into freer territories, away from the complicated, long, written-out compositions. (3) So, on Fourth (1971) (and on the BBC Compilation), we're treated to Elton's "Neo-Caliban Grides," a vehicle for him (and his mates) to frolic in free-playing, ED-style. The theme is little more than a fan-fare, an ascending scale-motif that ends with an exclamation. It's played twice, and that's it. The rest of the piece is completely free, though notes from the scale may be determinative, hard to say. Any reference to the "head" is oblique, if at all. It's four-way interaction with much cross-conversations happening. Unlike the Evan Parker/Derek Bailey method, which was contemporary, it still relies on ‘jazz', in the loosest sense: a vague pulse and conversational motifs that retain jazz phrasing. It's free playing with a jazz bent, though not free jazz blowing a la Ayler, Shepp, Pharaoh et al. It's much more slippery in its direction and highly dependent on ED's "free language." Trying to describe this in words is an exercise in futility. "Squiggles, blurts, chortles, trills and honks" are totally inadequate to describe his wide and flexible vocabulary. His techniques are not super-human, like Evan's, and available to any good saxist, but it's how he puts them to use which separates him from the average sax player. His timing of when to insert these seemingly random phrases is impeccable. Just impeccable. They push the piece forward, while commenting – rhythmically and "melodically" - on everything going on around him. They're models of how to "keep the balls in the air" once a free piece gets going and takes off. I was heavily influenced by his approach. It was intense but not over-whelming and maintained a quasi-lyricism throughout. 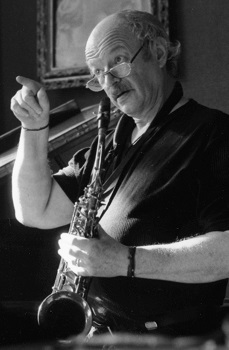 His free pieces lost a portion of Soft Machine fans, who like the complex, complicated gambits, but picked up others, like me, who were intrigued by the open-ended-ness of free improvisation. There are countless other examples of Elton's brilliance with numerous ensembles (particularly ones with his musical soulmate, Keith Tippitt) as well as on Soft Machine 5 (1972), and let me urge you to check out his entire discography, which is long and extensive. He was only 25 when Soft Machine Third came out. There's a treasure trove of ideas, expertise, aesthetic taste and joy in the playing of this "natural."